This second sequel to Frankenstein marks the series’ lengthy descent into the mediocrity (even Boris Karloff’s makeup isn’t as good!) that would eventually force the Monster to do battle with the likes of Bud Abbott and Lou Costello. 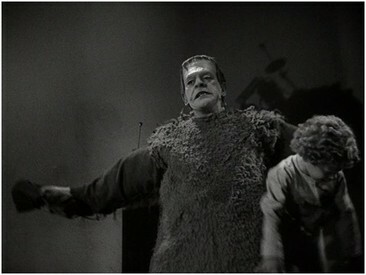 Though it isn’t readily apparent in this movie (chiefly because it’s camouflaged by a good cast), the seeds of everything that went wrong with the series were sown here – that being the reduction of the Monster from a tormented beast who is only seeking acceptance in an inhospitable world to a generic movie monster called Frankenstein. Basil Rathbone portrays Wolf, the son of the late Dr. Frankenstein and he’s coming home to claim the family estate (includes one spooky castle, blown up secret lab, hot sulfur pit, comatose monster, and demented grave robber named Ygor), much to the locals’ collective chagrin. See, these townies apparently are fairly petty when it comes to holding grudges because they’re still whining around that the elder Frankenstein created a Monster that went on a rampage and ruined the local Oktoberfest! No sooner has Wolf settled into his new abode then does the local fuzz roll around to roust him a bit regarding his family’s history with re-animating corpses. Making his first appearance in a Frankenstein movie (he would have a role in all the remaining sequels – usually as an Inspector of some type) is Lionel Atwill. This time the name of the inspector he is playing is Krogh. Krogh is more than just a throw away authority figure to harass Frankenstein and rouse angry mobs. As a little boy, his arm was ripped off by the Monster, thus depriving him of the career as a soldier he so dearly wanted. Now he must be satisfied commanding about six or seven cops in this little village. He isn’t the one-dimensional sour jerk you would expect from such a past. Though somewhat wary of Frankenstein, he is determined to uphold the rule of law in his community, offering to protect the good doctor, should the townsfolk get too rowdy and try anything unseemly. Maybe he’s only offering to do this to stay close to Frankenstein (it’s obvious that he doesn’t trust him entirely), but it gives the character more depth than expected from such a role. Additionally, because of his bum arm, you get a lot scenes where he is moving it around with his other arm in a very stiff manner so that you are reminded of Dr. Strangelove. Back at the Frankenstein lab which still has a hole in the roof where the villagers nuked it the last time there was a monster rampage, Wolf encounters the cuddly little deformed freak called Ygor. 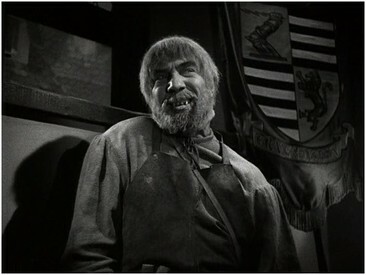 Ygor is played by Bela Lugosi who does a nice job in his role. He’s saddled with an awful wig, beard, and really ugly dentures, not to mention his twisted neck, but he is convincingly creepy, psychotic, and a fairly clever little worm. Ygor was hanged for stealing bodies, but even though his neck was twisted or snapped or something, he survived! Now, mysteriously the people who condemned him to death are all dying themselves. Ygor is such a piece a work he even gleefully notes this to the law enforcement types in town who confront him about it. This is one case where Lugosi’s natural tendency to ham it up suits his character. As a shady, sleazy hermit, hunchback type, you want someone to be a bit over the top because that’s how those folks are in real life! Ygor leads Wolf to the crypt where his father and grandfather are interred. The Monster is also present and apparently lifeless, but he has updated his wardrobe. Unfortunately he updated it to about 1971 because he’s wearing this furry vest that would have been right at home on Sonny Bono when he had that awful show with Cher! Ygor explains that he and the monster are pals and that somehow or other the Monster survived the explosion at the end of Bride Of Frankenstein, but that later the Monster got hit by lightning and just hasn’t been his murderous self ever since. Ygor wonders if maybe Wolf could revive the monster. Wolf, who idolizes his dad a lot more than he should, agrees to do so. Once revived, Ygor uses the Monster to hunt down the people who sentenced him to hang and kills them. At this point, the creature doesn’t resemble in the slightest, the Monster we saw in the first two movies. He is simply a bloodthirsty killer and any sympathy for the Monster evaporates, lessening the impact the movie ultimately has, reducing it simply to a “monster on the loose” film. The Monster himself gets very little screen time and there’s lots of scenes where Krogh and Wolf blab about whether he’s building a monster or responsible for the spate of killings, leading this movie to feel a lot longer than it was. The performances were decent, with Krogh being complex enough to be interesting and Bela harnessing his “talents” for good effect. 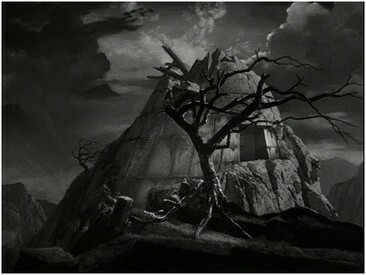 The set design evoked a feeling of some type of fairy tale with its high ceilings, giant odd shaped rooms, and twisted staircases. It certainly holds the viewer’s eye. Call it Mary Shelley by way of Dr. Seuss. It’s just unfortunate that it was all wasted such a meager story. 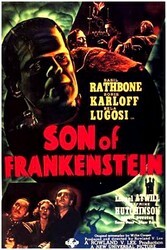 The whole thing feels strictly minor league after viewing it in succession with Frankenstein and Bride Of Frankenstein. Surely Universal had to know that the success of those movies was because of the pathos the Monster exhibited in them and that the audience identified and empathized with him. How can anyone expect to empathize with a monster that spends its time knocking off the enemies of a body snatching hermit? This is the movie where you can see the transition being made in this series from headlining feature to cheap programmer, much like Universal’s forgettable sequels to The Mummy.